Fireworks, who doesn't love them? But how do you shoot them? 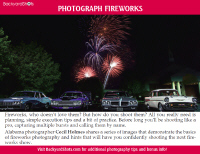 Alabama photographer Cecil Holmes shares a series of images that demonstrate the basics of fireworks photography and hints that will have you confidently shooting the next fireworks show!